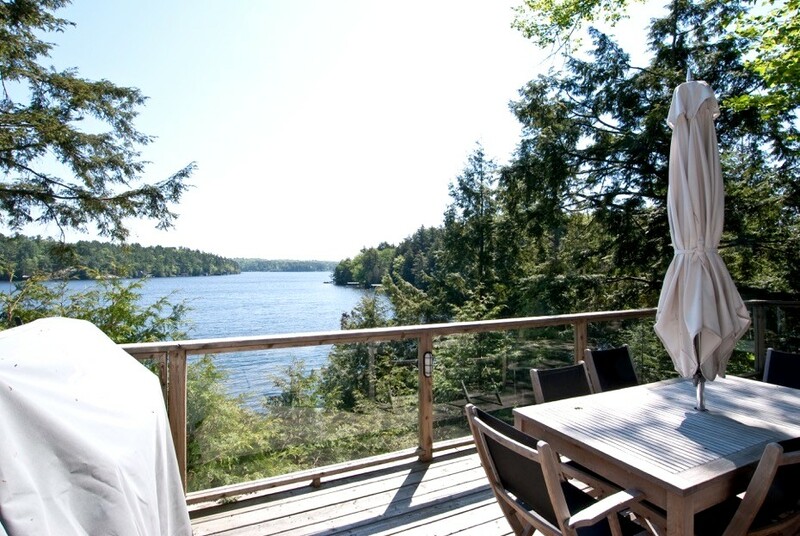 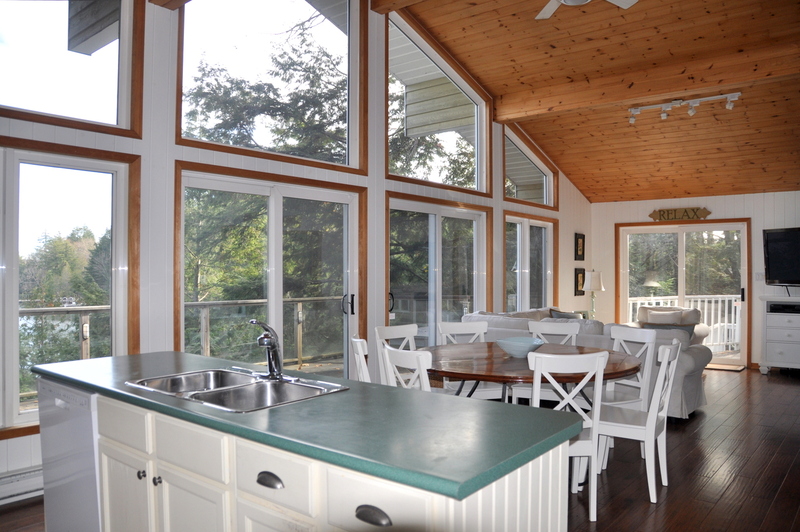 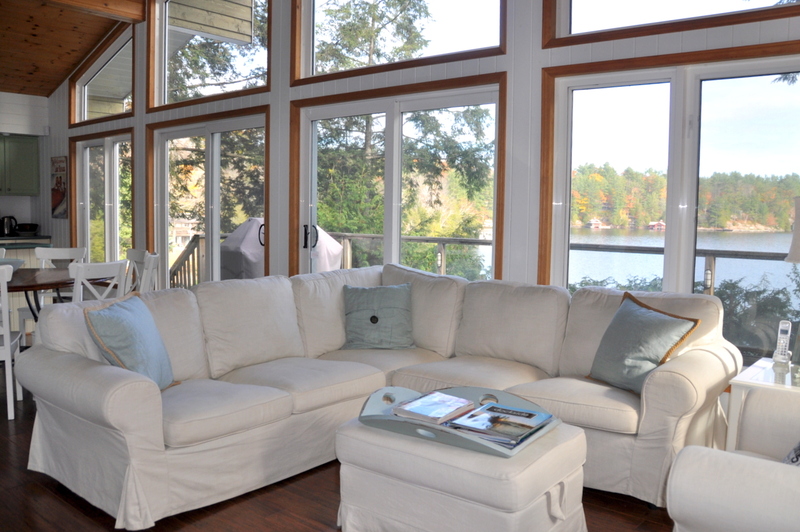 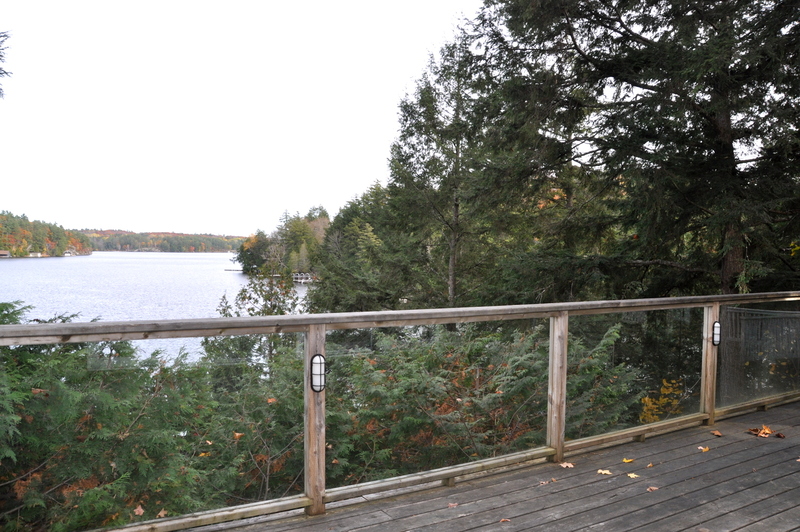 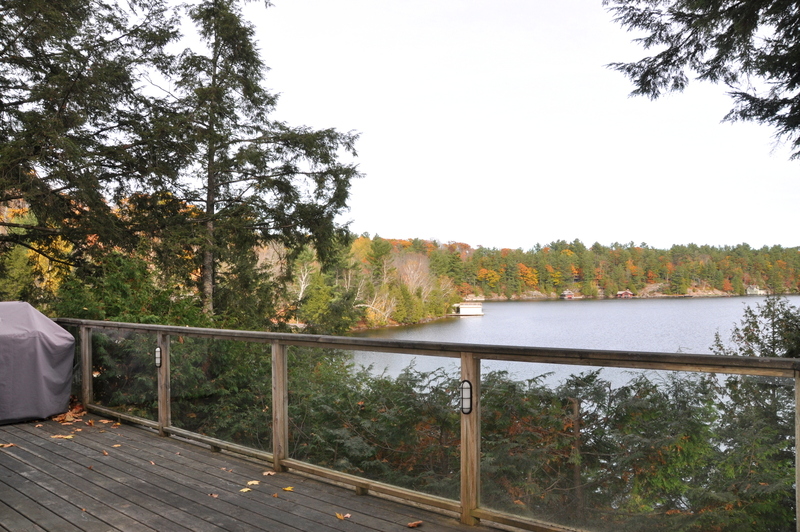 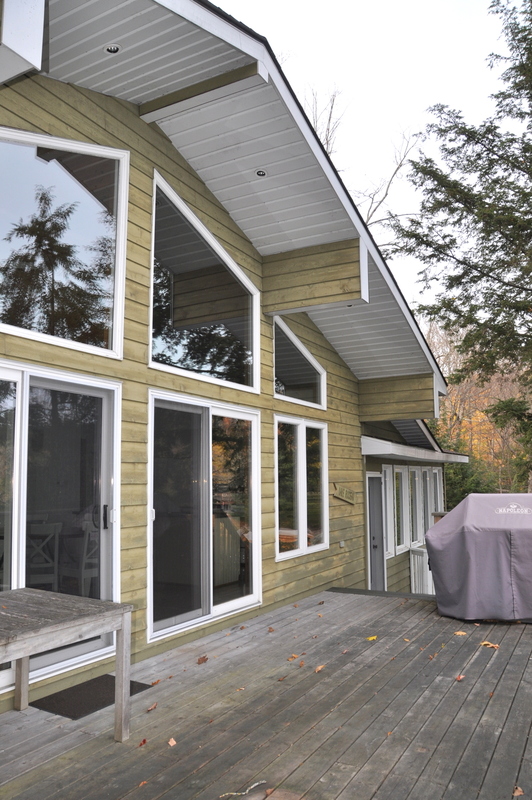 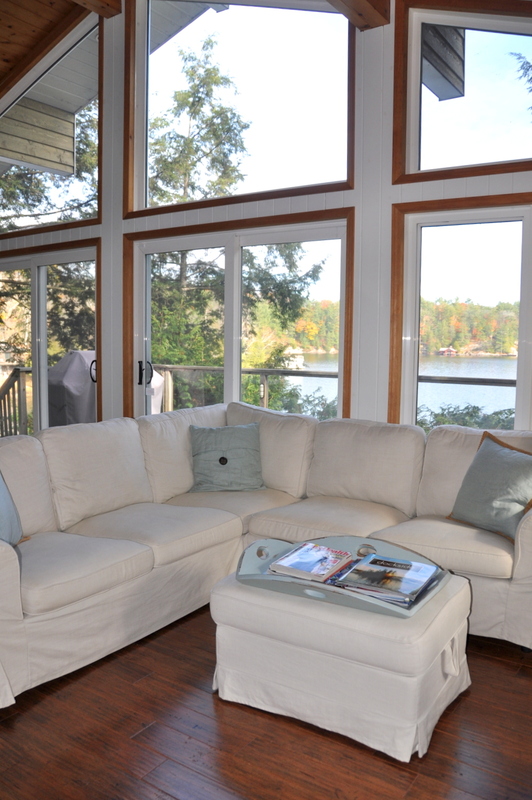 "Cameron Bay on Lake Rosseau"
This wonderful 4 bedroom, 1800 sq. 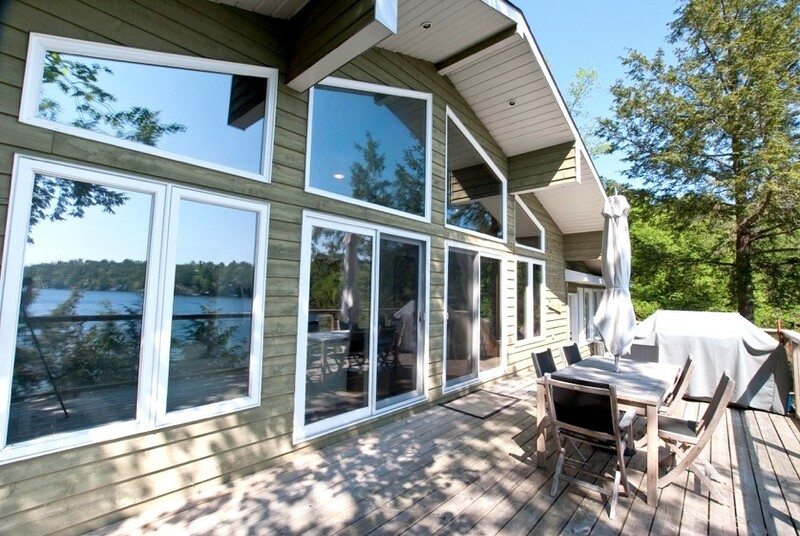 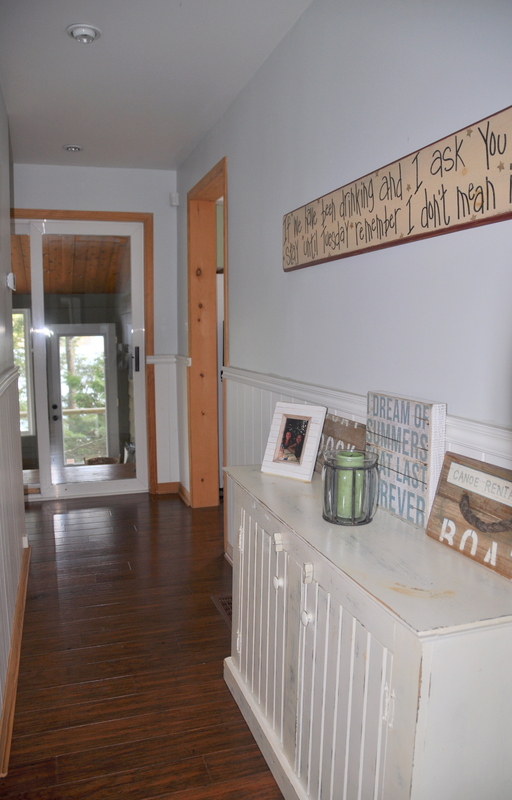 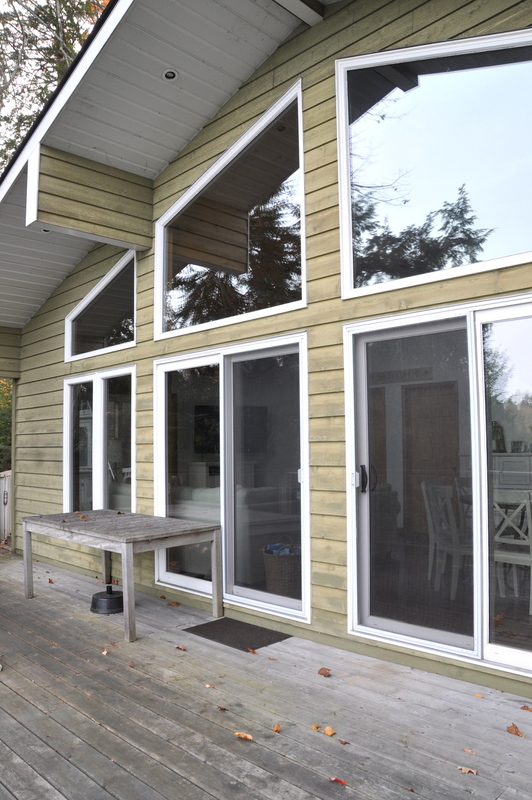 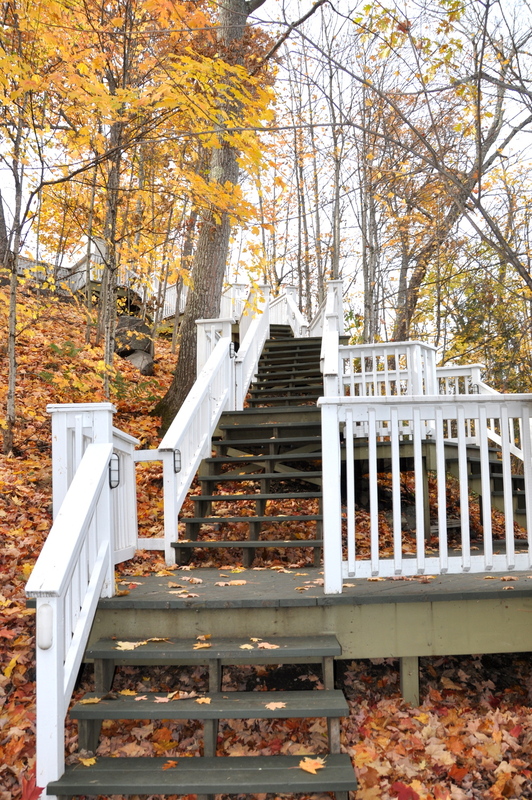 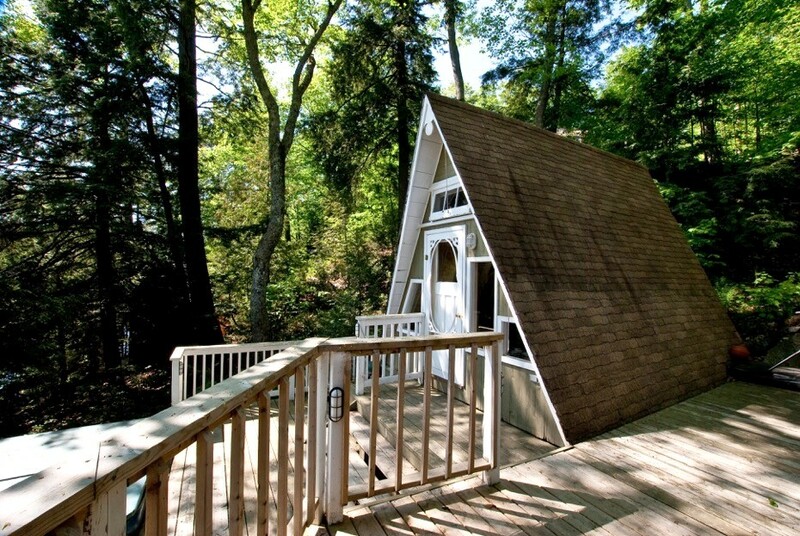 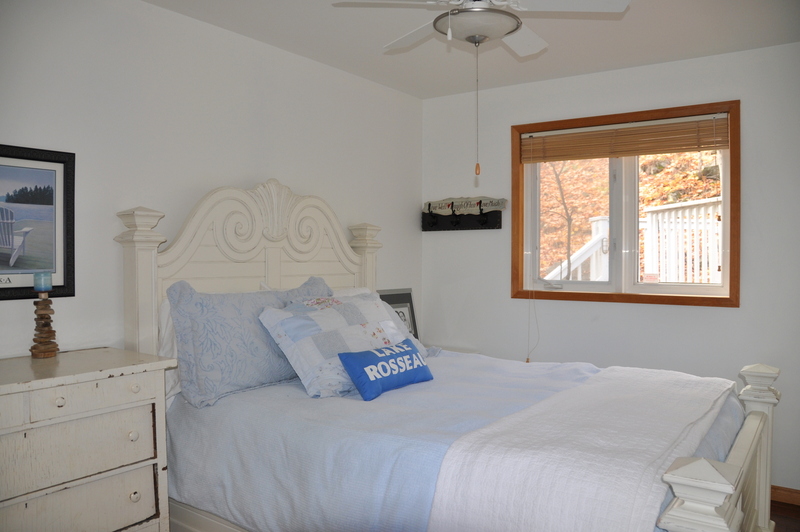 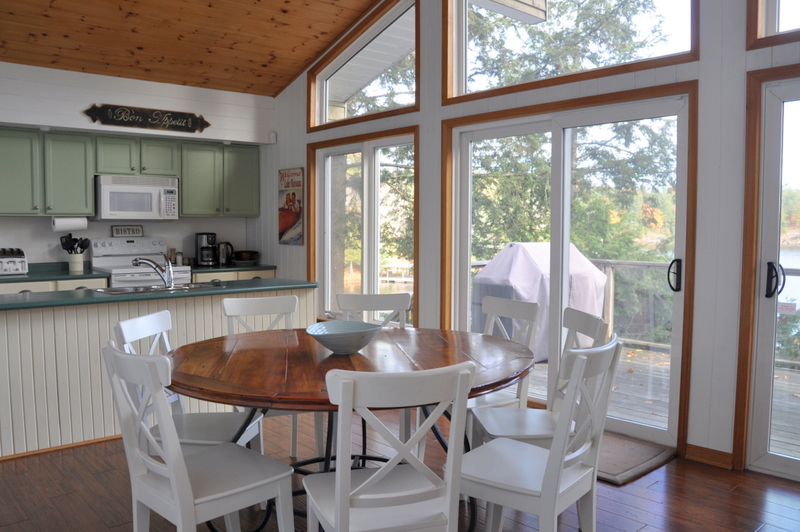 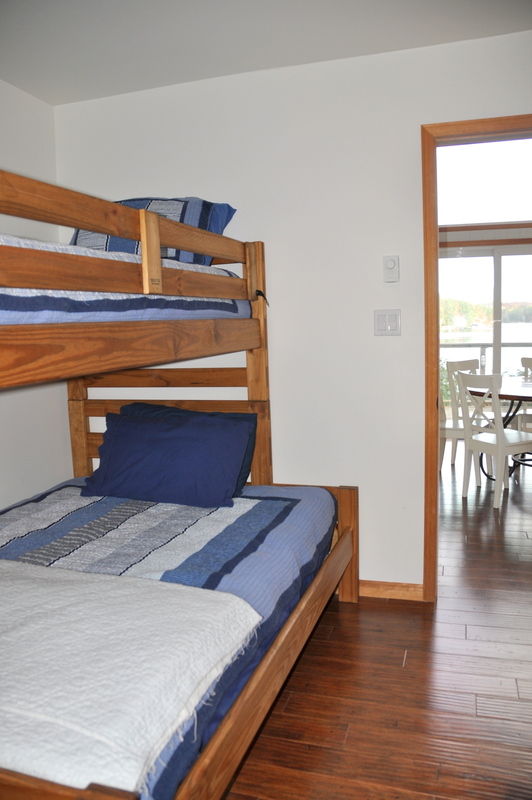 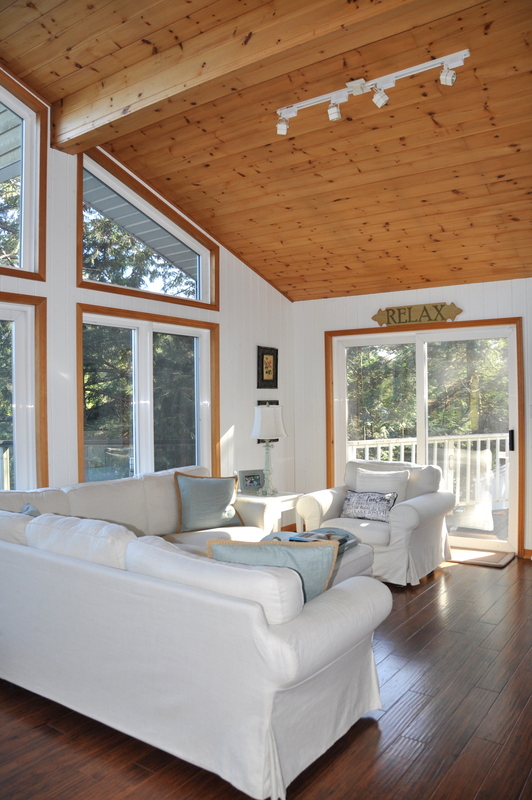 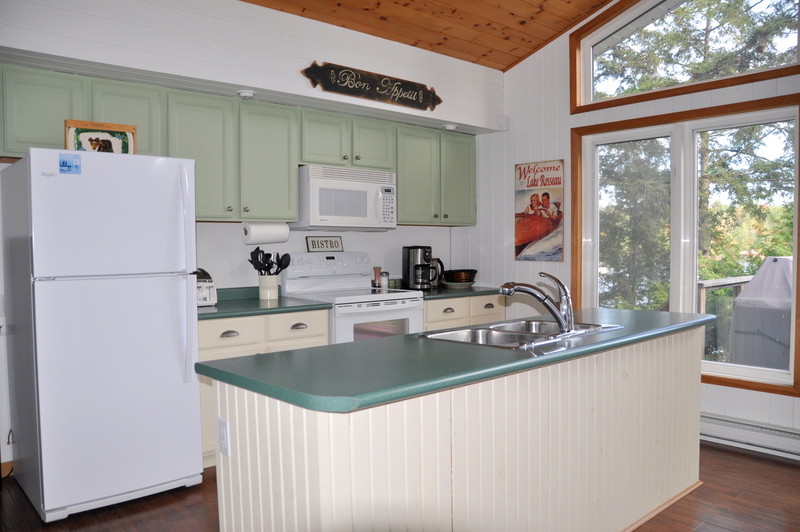 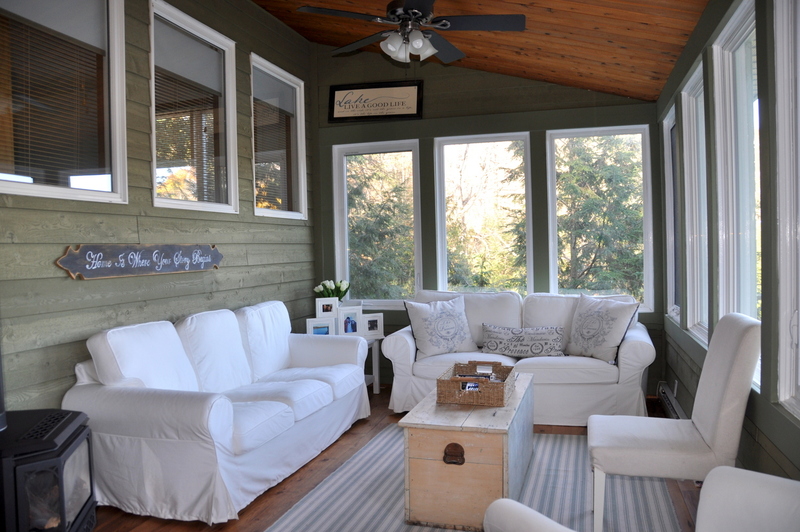 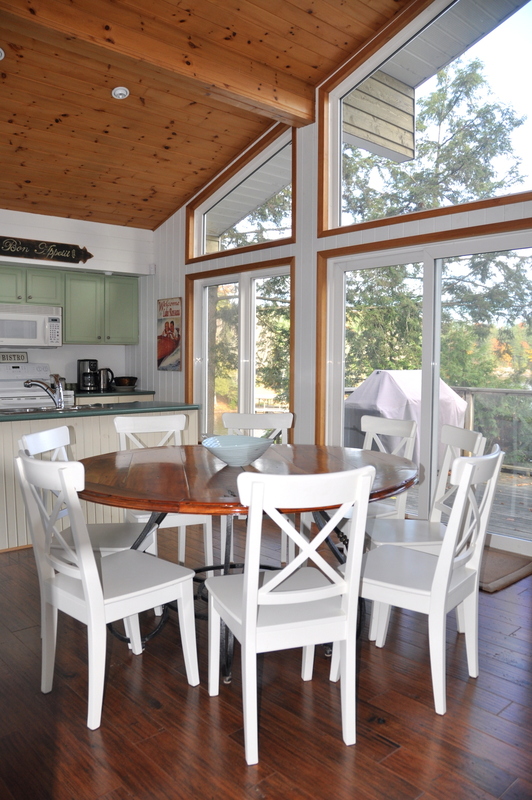 ft. cottage with Bunkie, sits perched above expansive open water on the shores of ever popular Lake Rosseau. 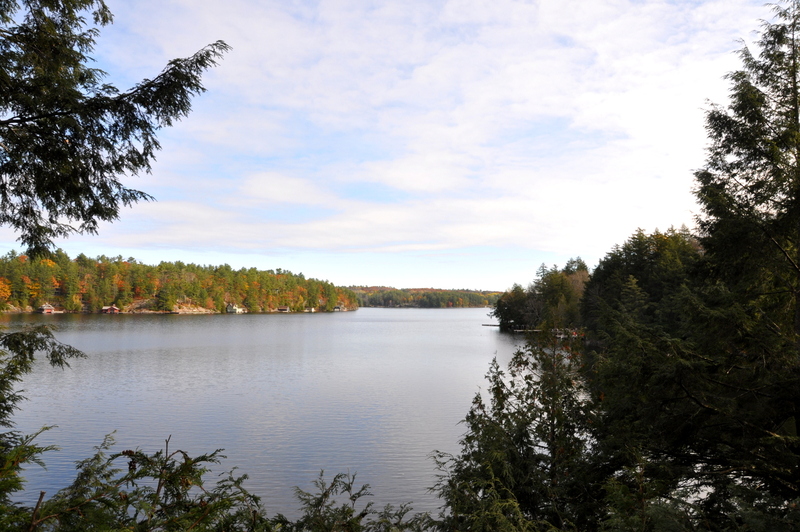 Nestled into 1.5 acres of wooded land, you will be treated to a tranquil environment and yet be just 3km from the quaint village of Rosseau. 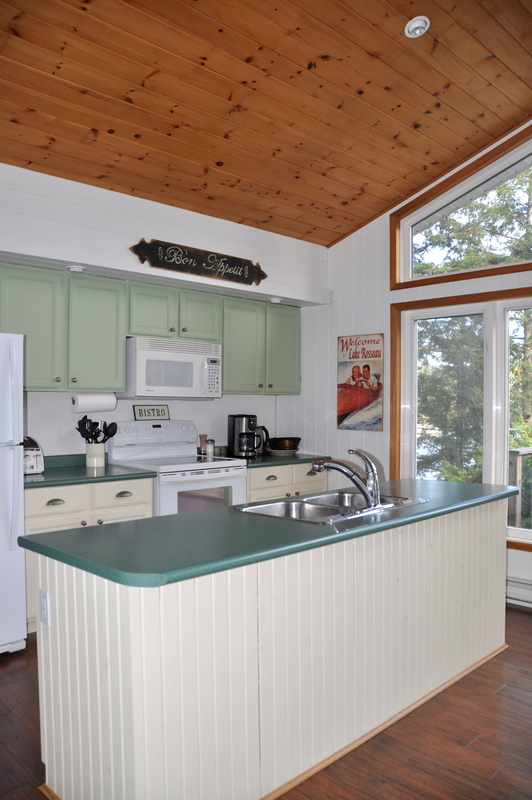 The open concept kitchen/dining/living room, with its gorgeous pine cathedral ceiling and wall of picture windows, offers plenty of natural ambient light and fabulous tree-top views of the lake. 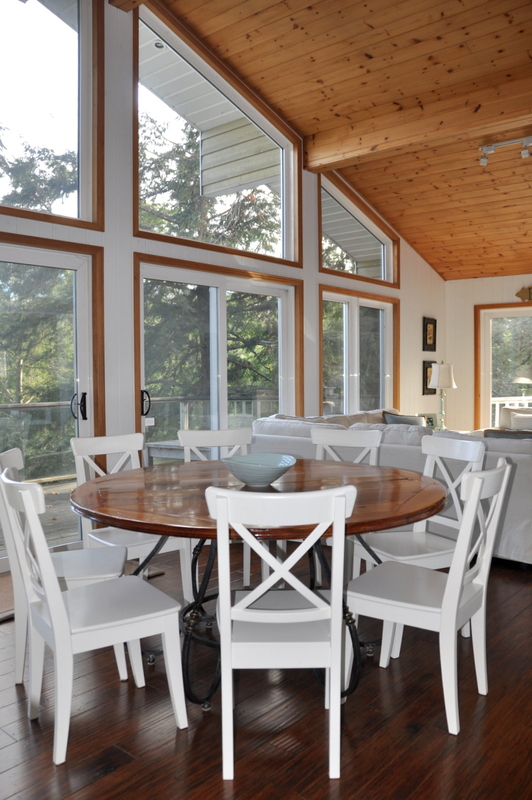 Tastefully decorated with beautiful engineered wood floors, the entire room emanates comfort and ease. 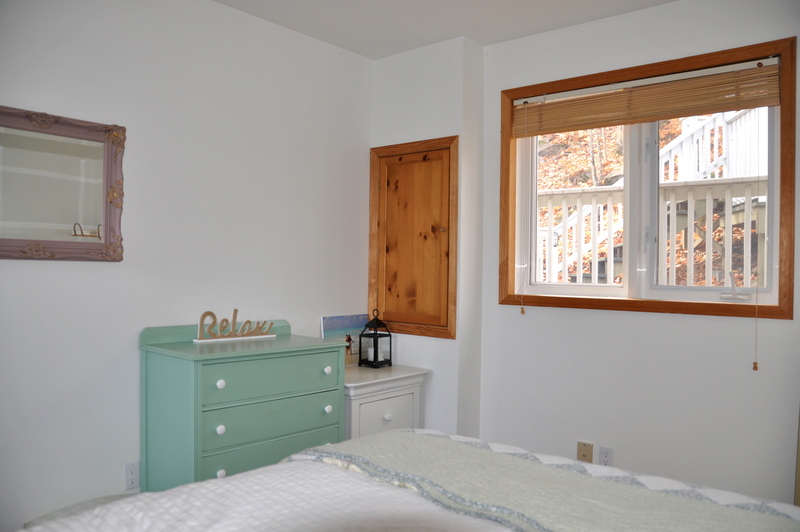 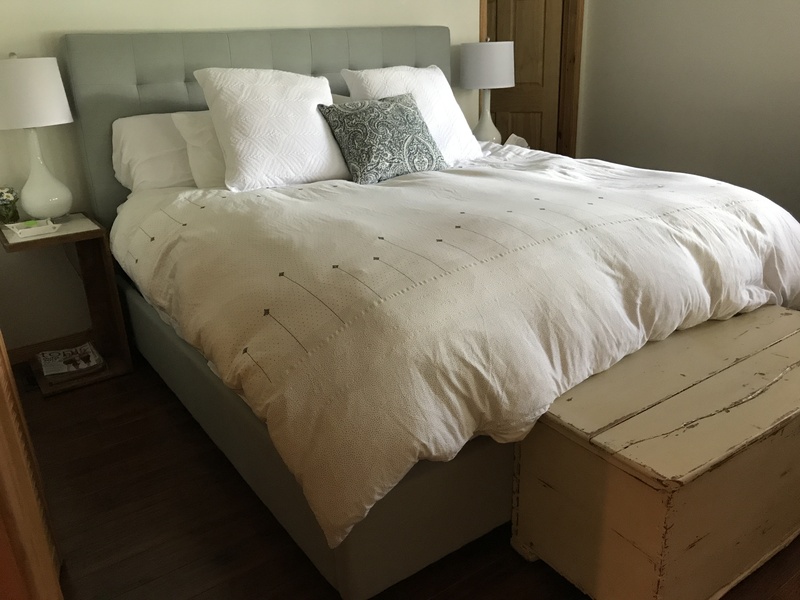 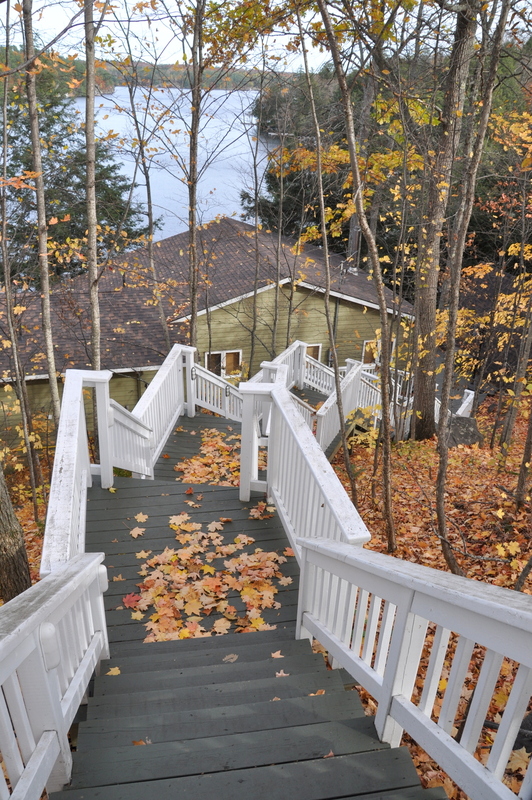 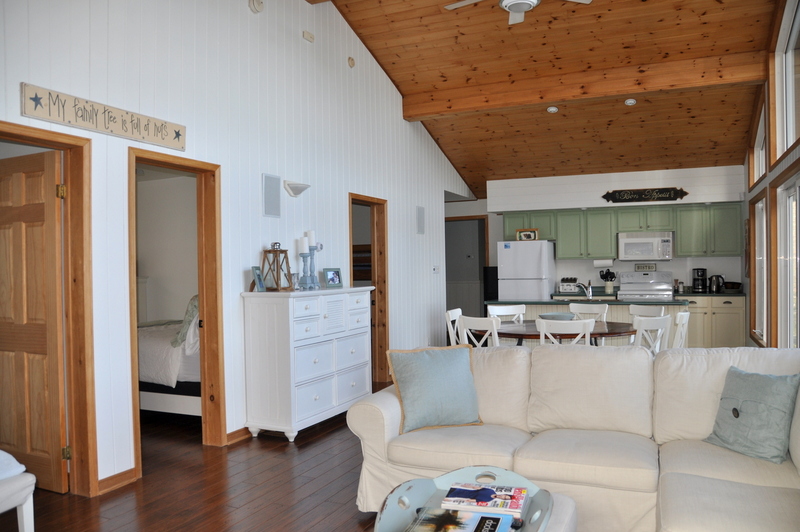 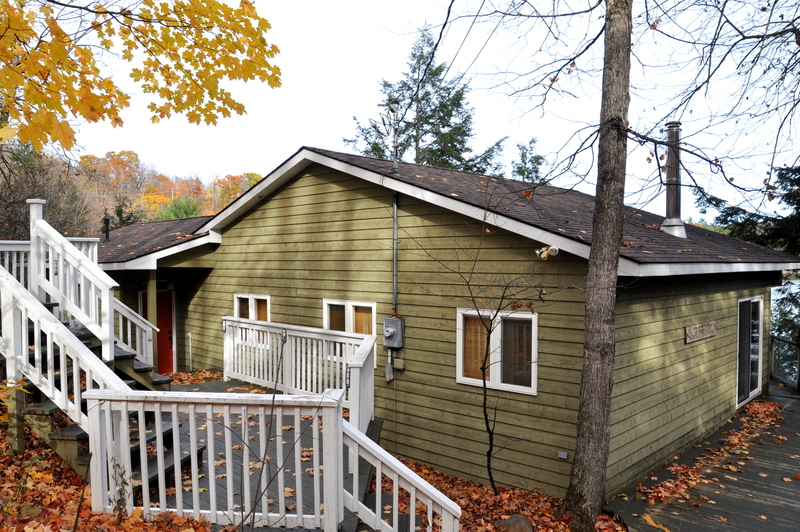 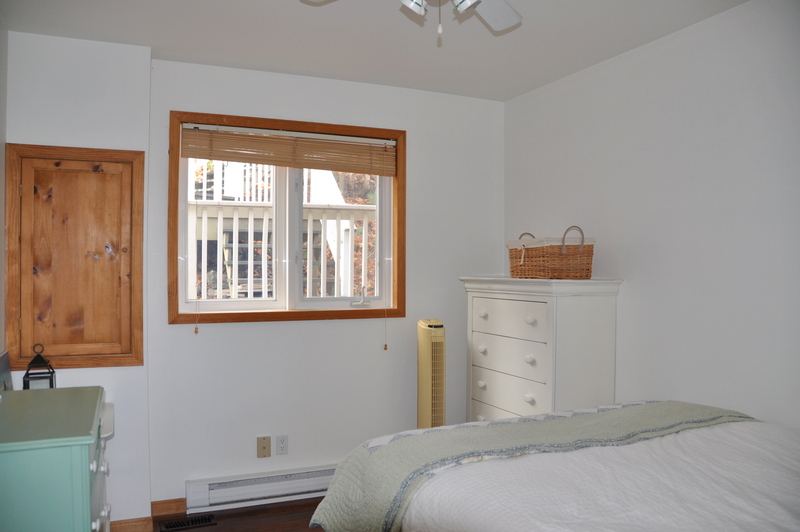 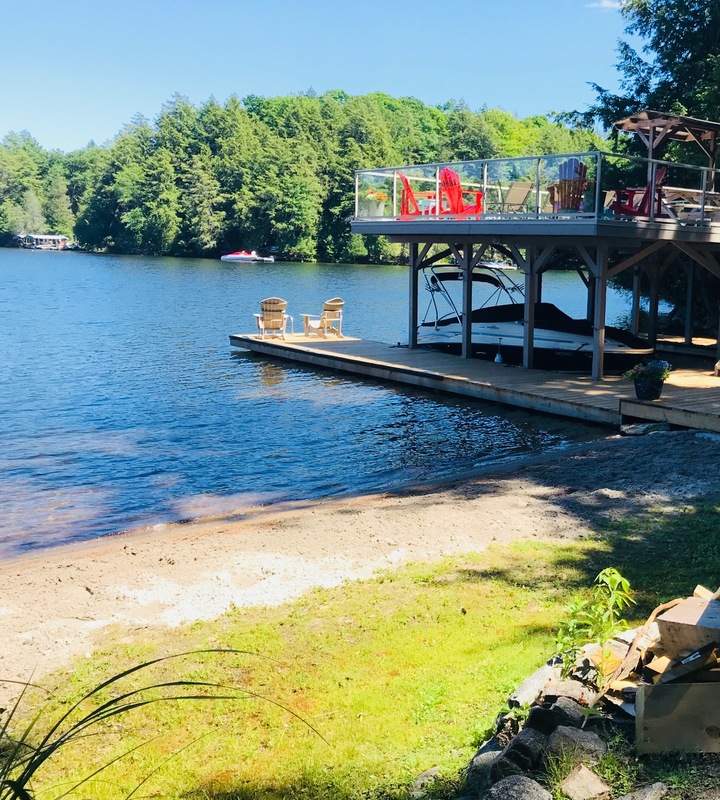 Laid out on one main level, 3 bedrooms and a 4-piece bathroom are all just off of the Great room, while the generous-sized master bedroom with its own 3-piece ensuite is located at the opposite end of the cottage providing great privacy. 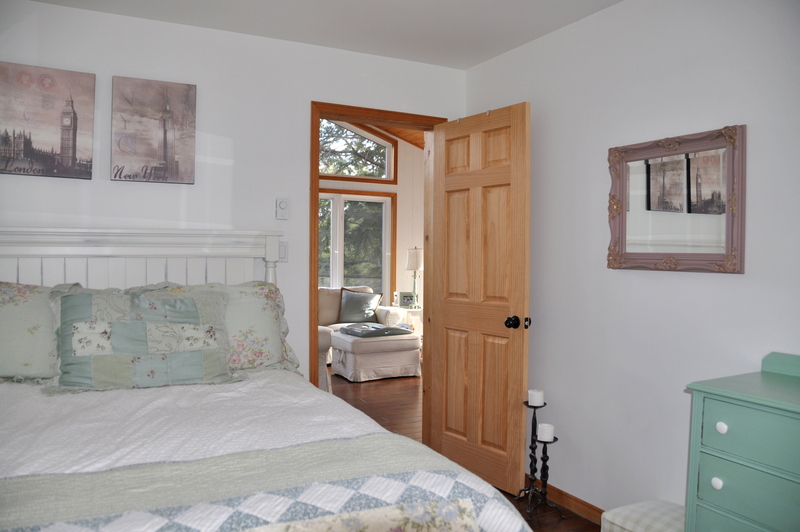 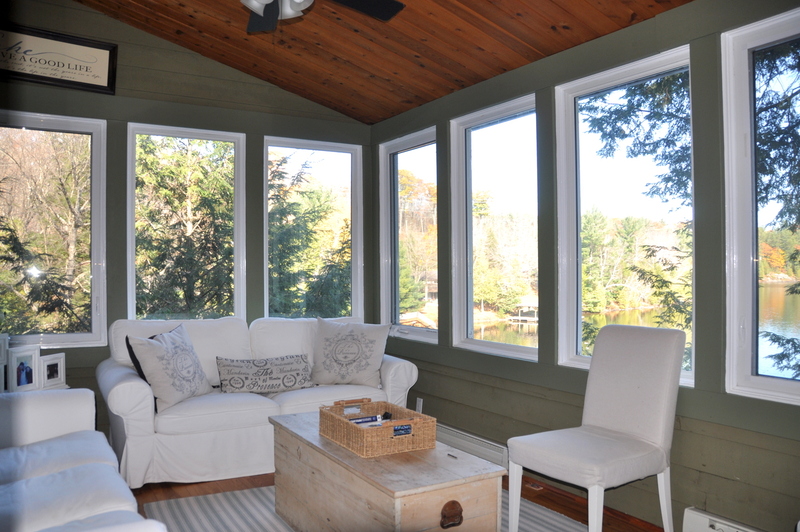 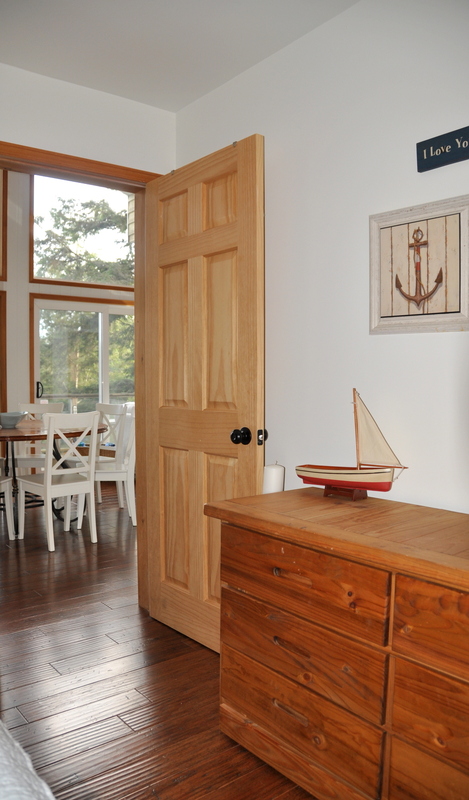 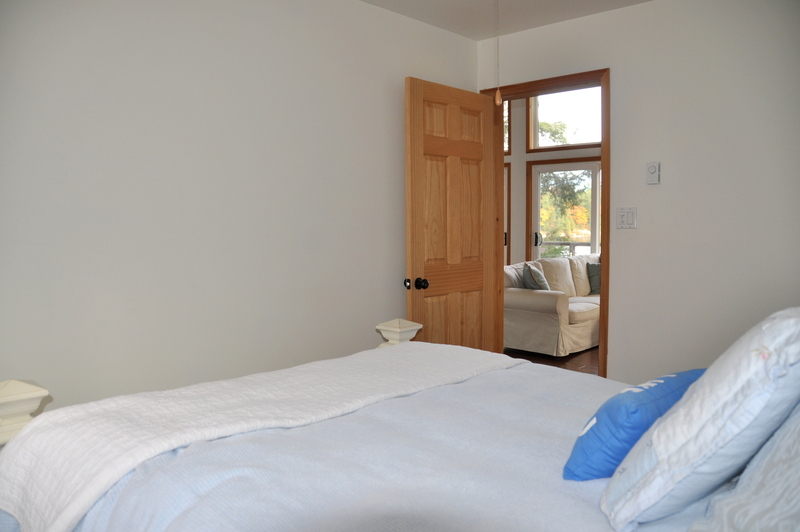 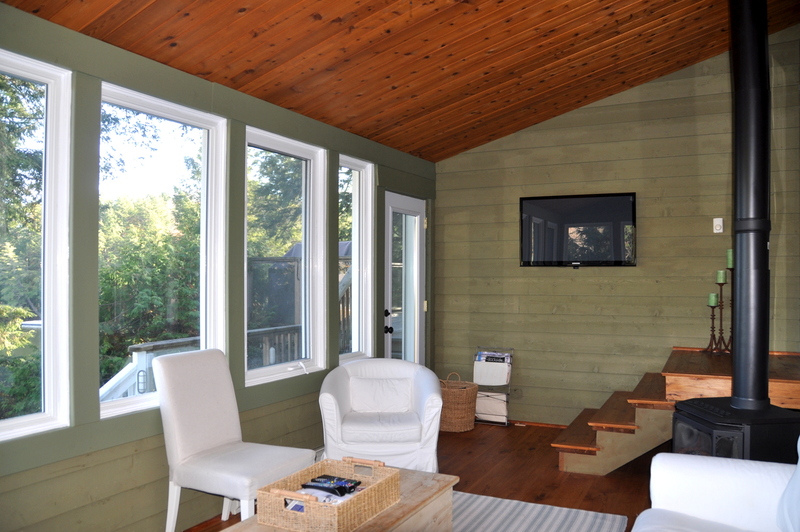 Rain or shine, a great place to sit and relax is in the sunken lake-facing Muskoka room just off of the master bedroom Settle in here by the gas stove, with the calming scent of the cedar floors, and read a long overdue novel or catch a movie or a nap. 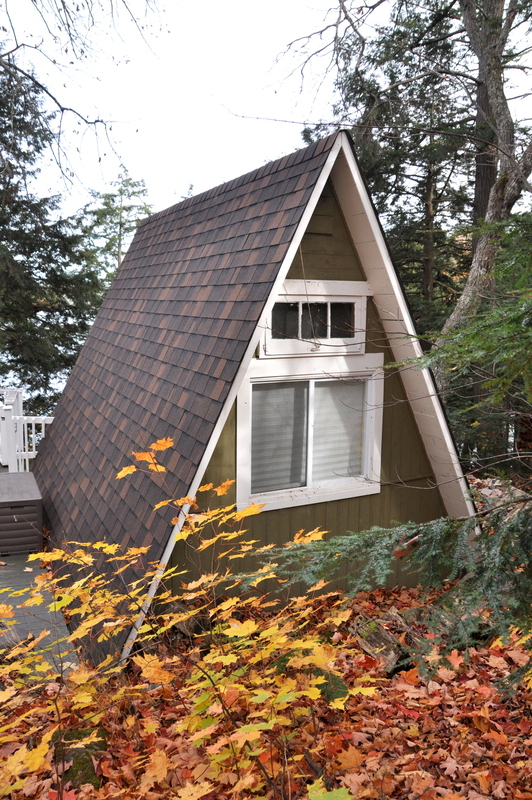 The cottage is built high up but close to the shore with magnificent tree-top west views. 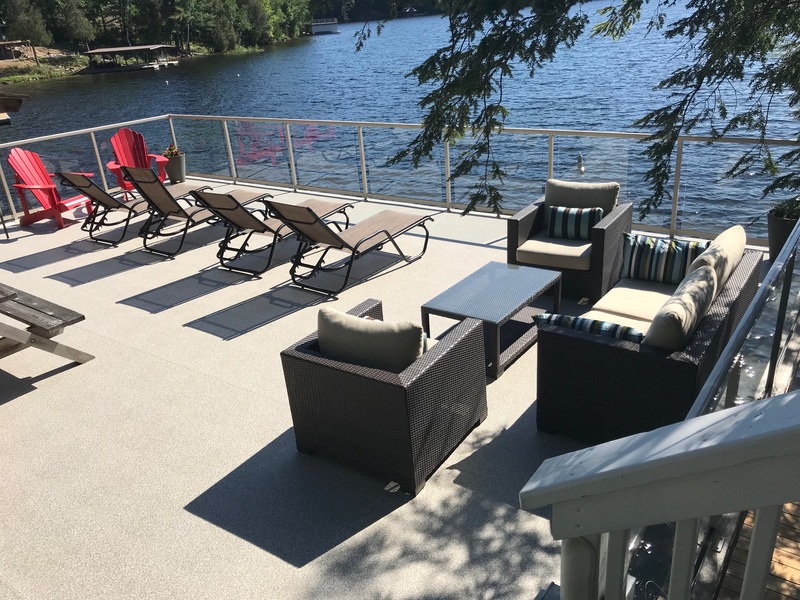 The top deck is definitely where you will want to start your mornings enjoying a cup of java or dining outside with a BBQ lunch or dinner. 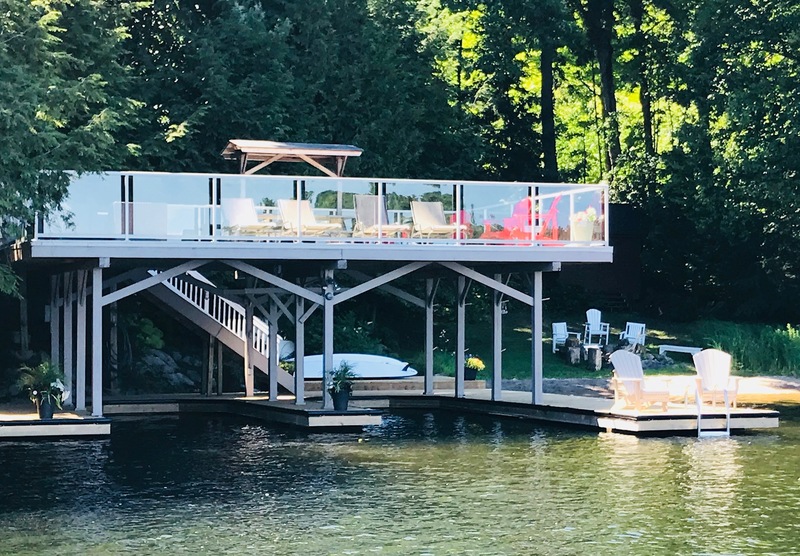 Head down to the spacious sundeck over the boat port, bask in the sunshine then refresh yourself with a short swim out to the water trampoline. 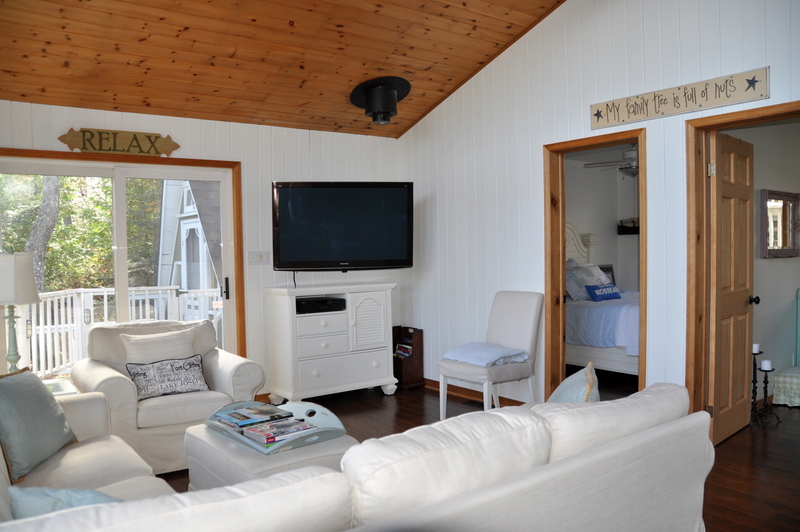 Take a paddle board or kayak out any time of day as you are tucked into a bay that rarely has a wave, only a gentle current. 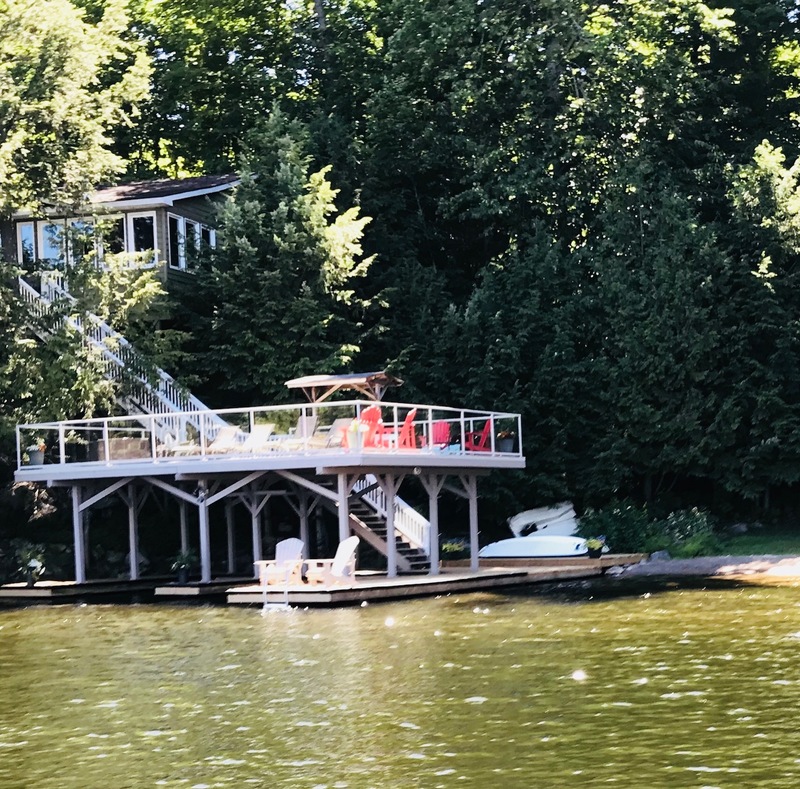 With 200 feet of waterfront and a rare sandy beach, family members of all ages will feel comfortable at the water’s edge and enjoy hours on end of splashing and playing. 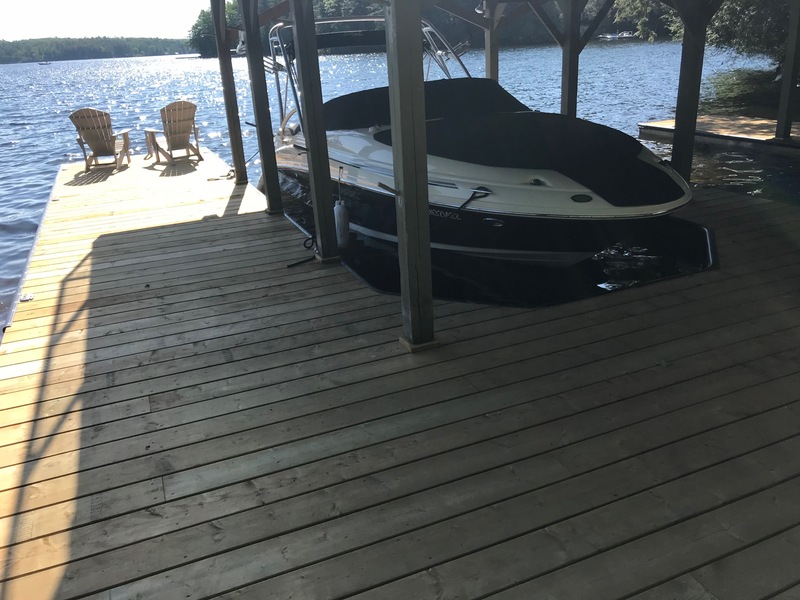 Rent or bring your own boat and discover the extensive network connecting the “Big Three” (Lake Rosseau to Lake Joseph and Lake Muskoka via river and lock systems). 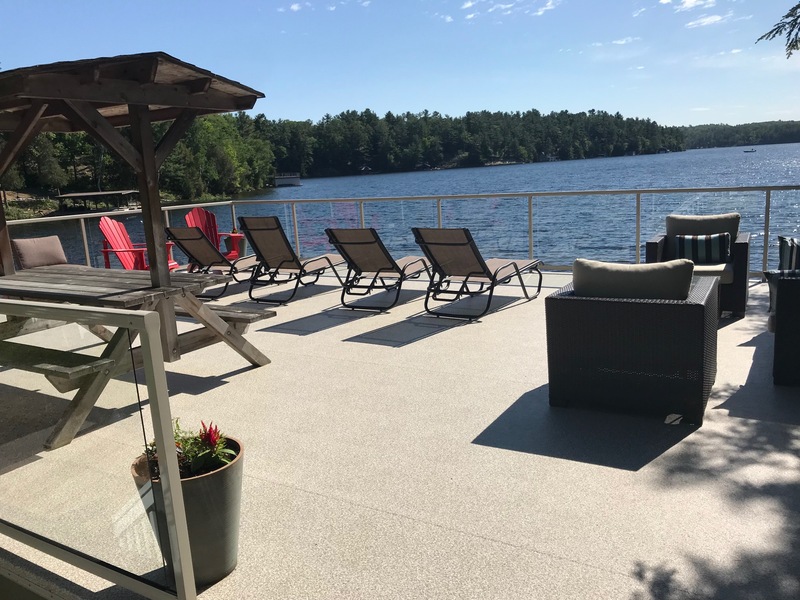 It is a must to take a short drive into Rosseau, especially on a summer Friday, and enjoy the Farmer's Market at the boat launch and park. 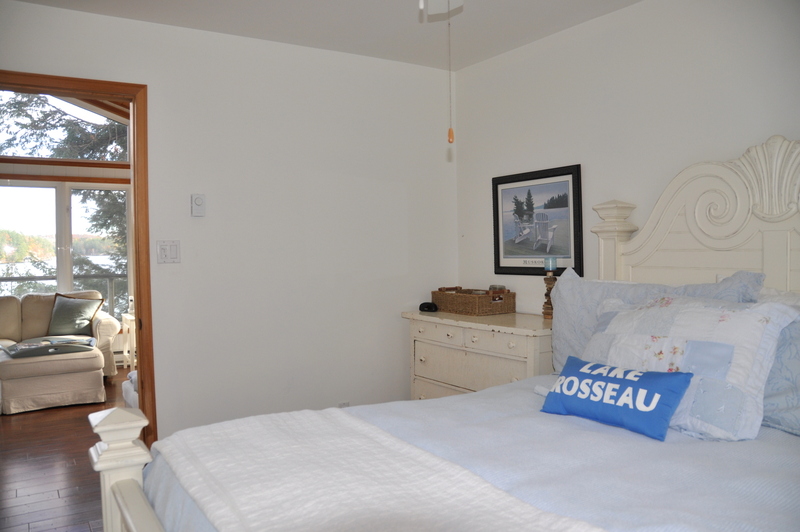 Today Magazine refers to The Rosseau General Store as "an eclectic emporium where you can find just about anything you could reasonably want, a village Wal-Mart but with infinitely more character". 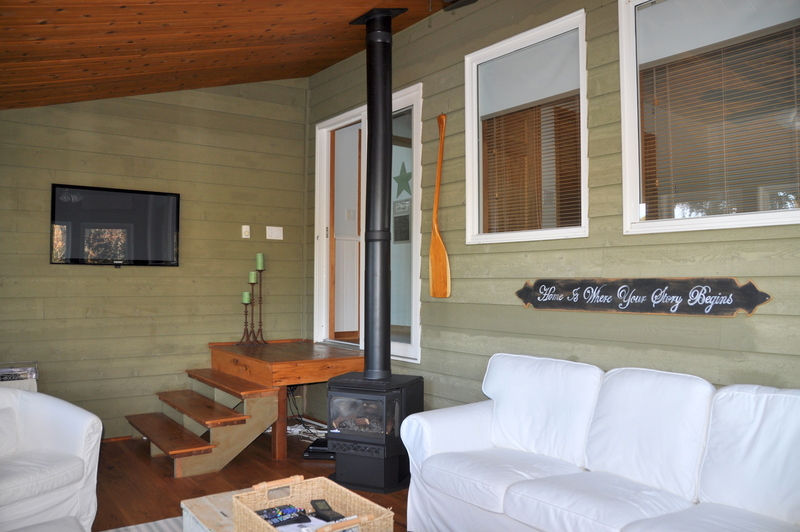 End your evenings by the fire pit on the beach and take in the spectacular sunsets as you reminisce about the day's fun adventures! 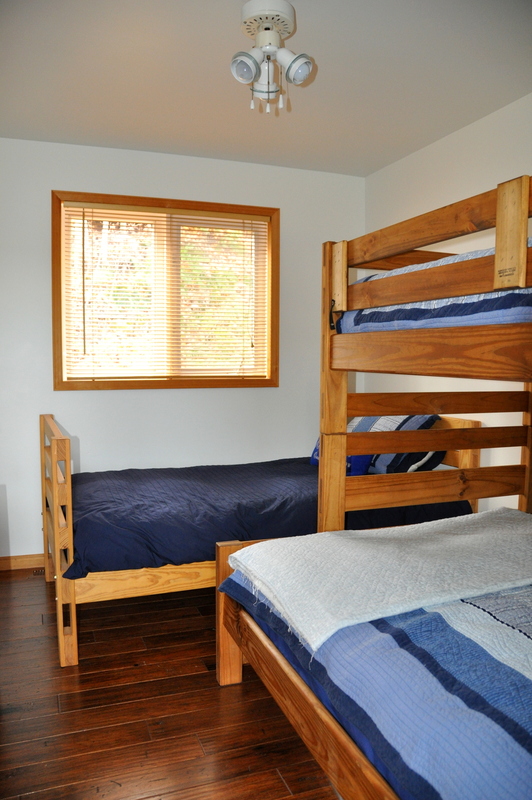 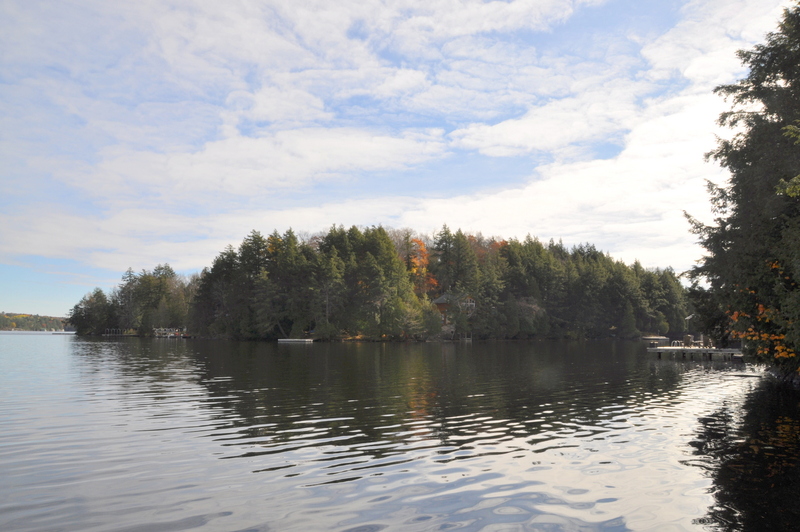 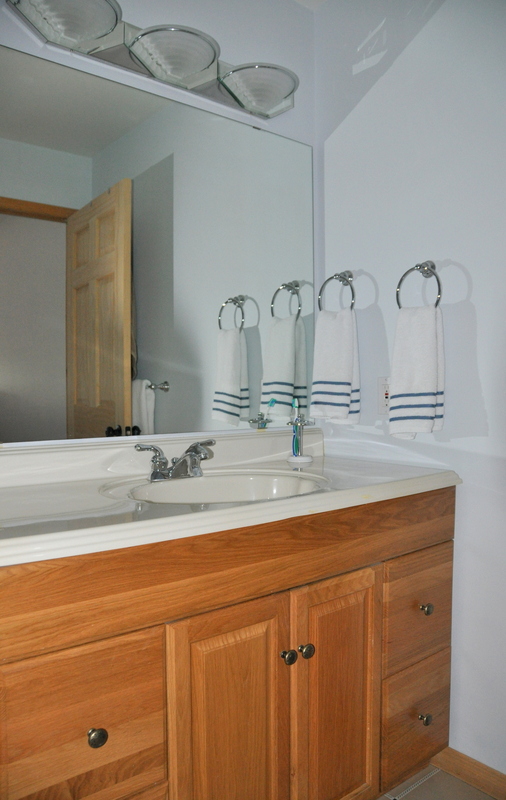 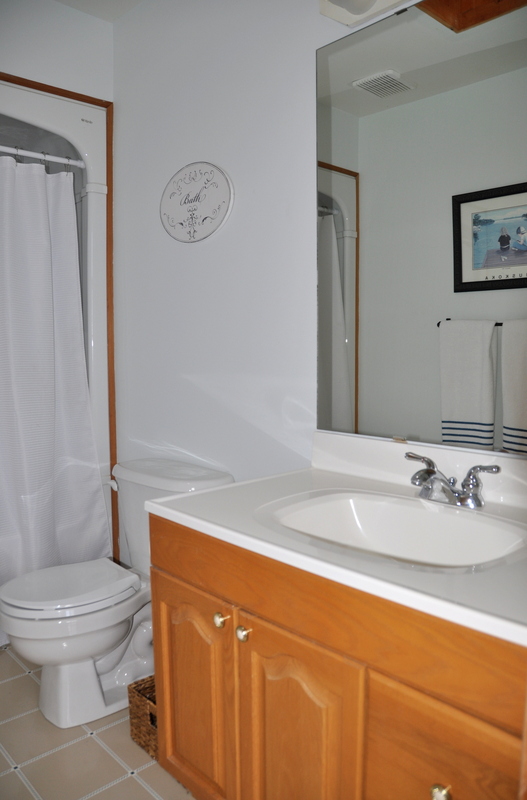 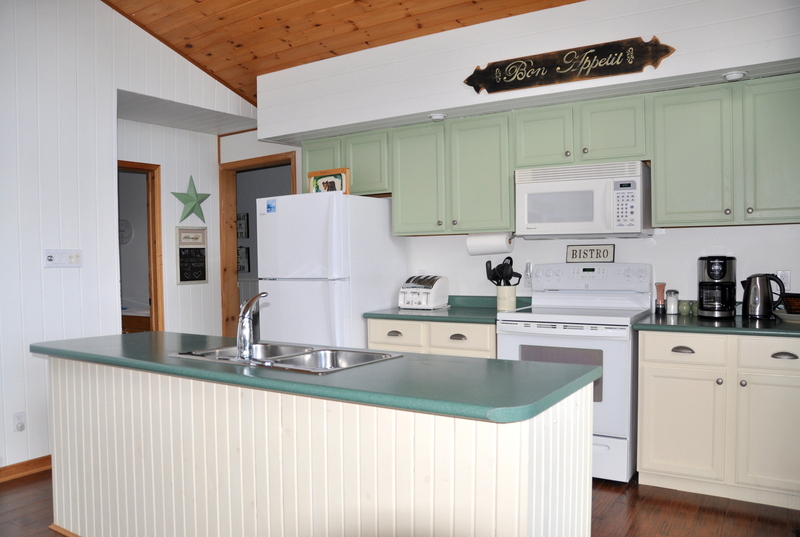 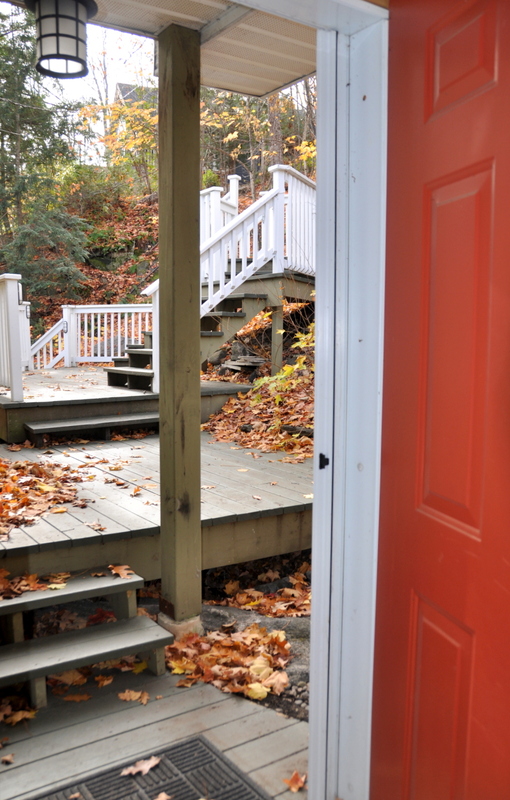 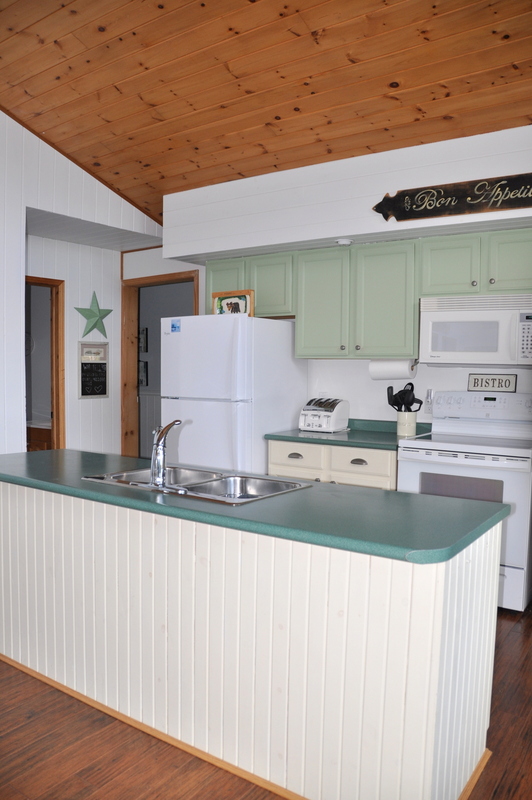 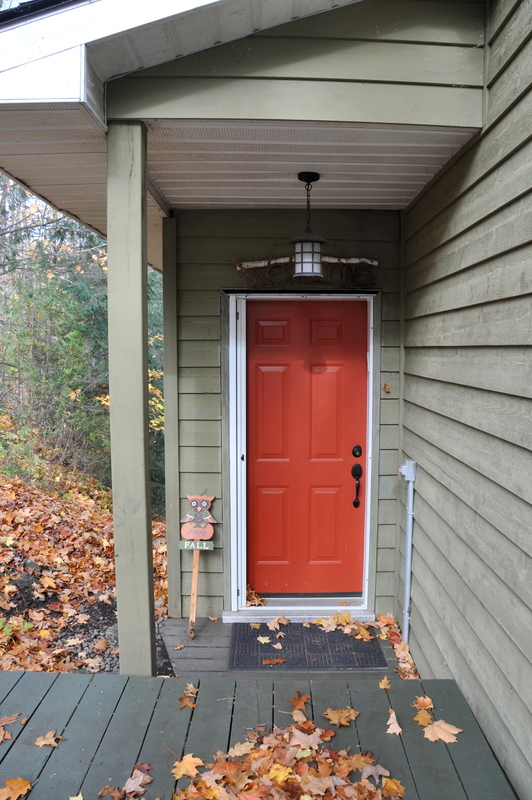 No better time than now to embrace cottage life in the heart of cottage country than here at this fantastic property! 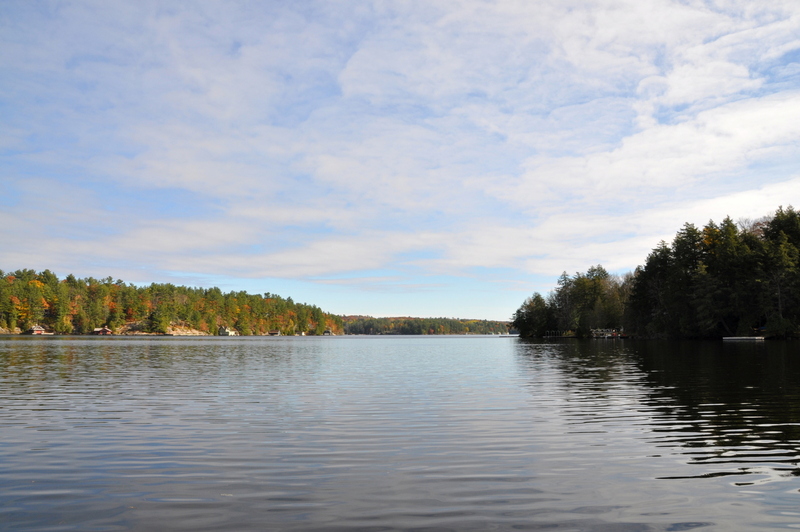 LOCATION: About 2.5hrs. 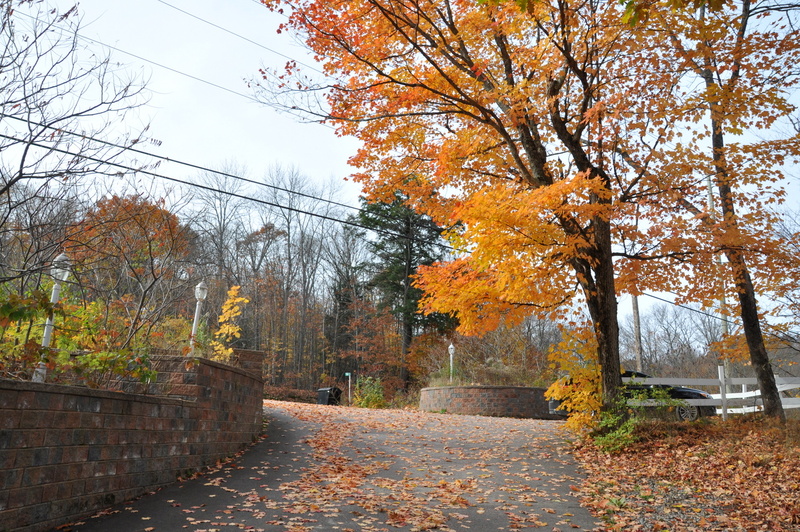 from Toronto. 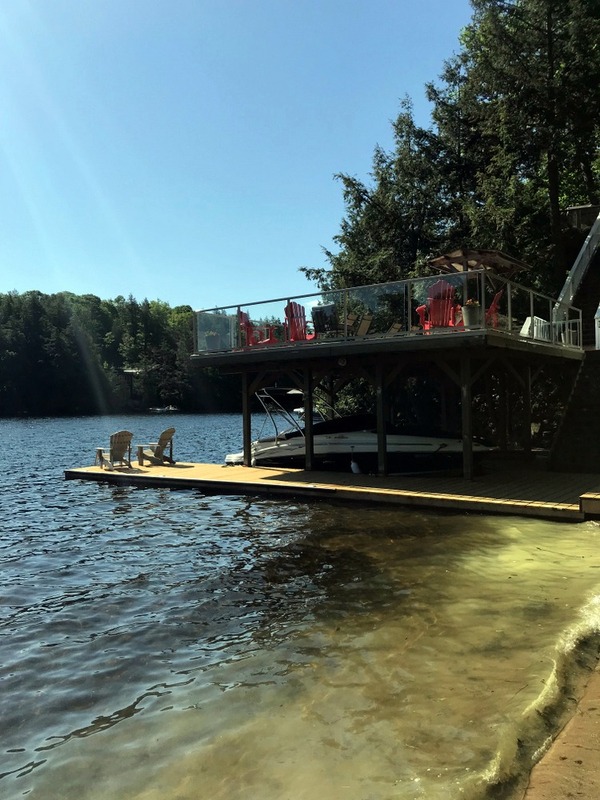 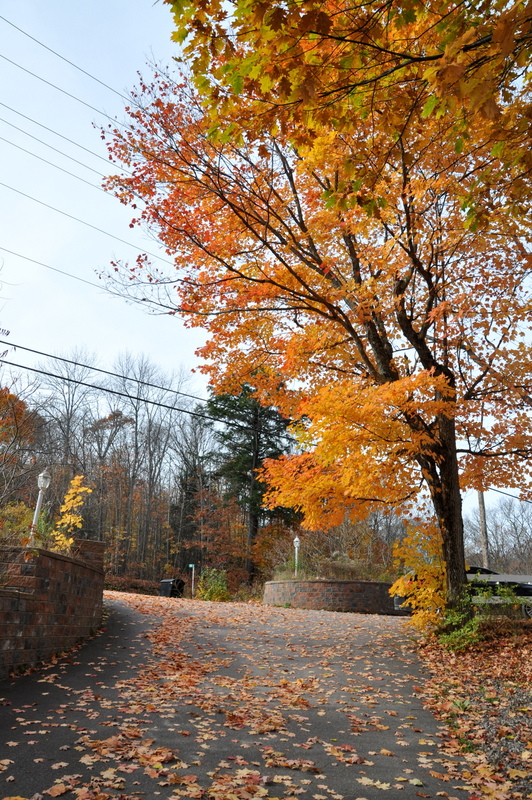 About 5 minutes from the village of Rosseau,10 minutes to the smaller village of Minett (which has 2 of Muskoka's leading resorts: Clevelands House [opened in 1869] and the JW Marriot hotel and spa ). 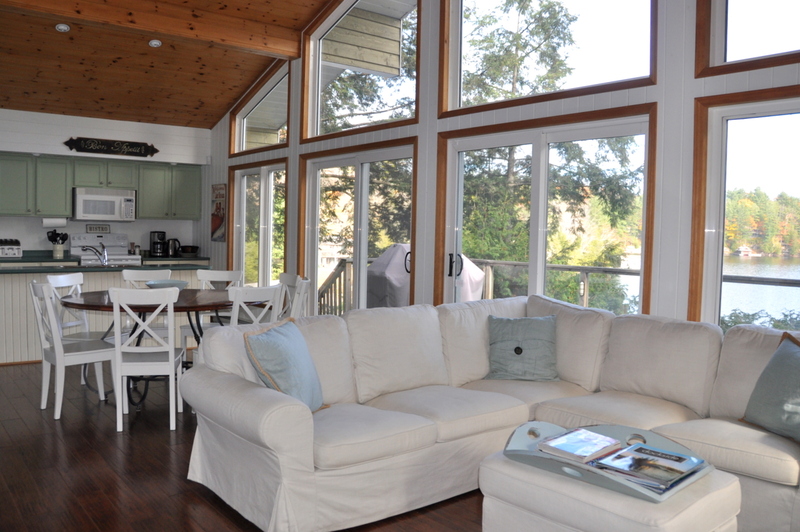 About 25 minutes from Port Carling for shopping, dining, LCBO, groceries and more. 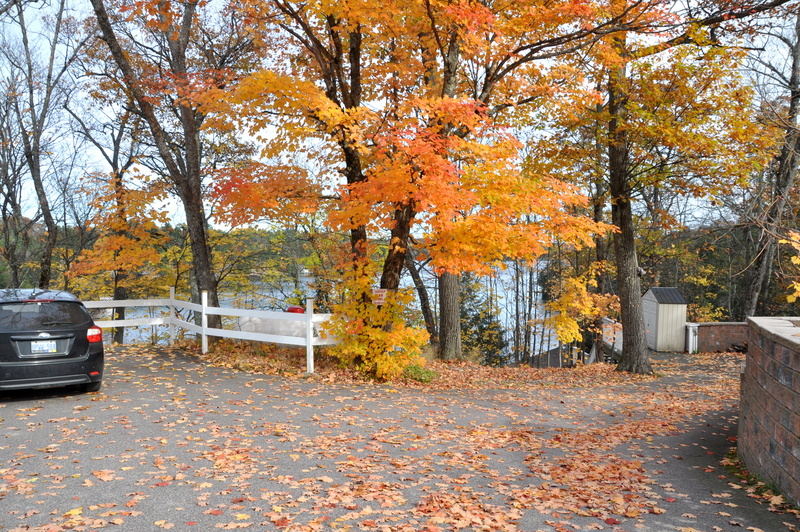 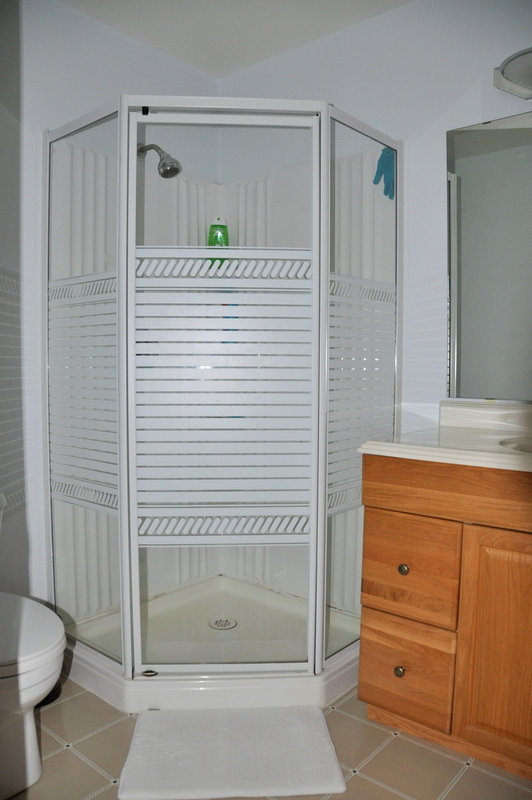 Close to some of the great golf courses the area has to offer. 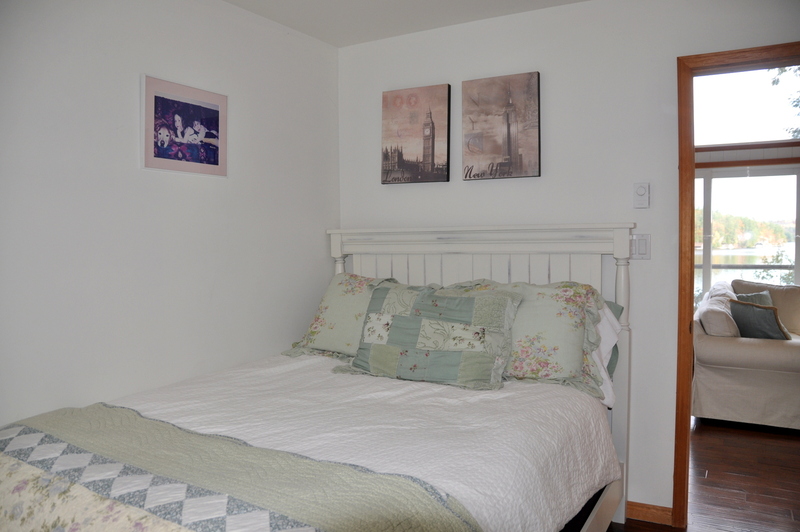 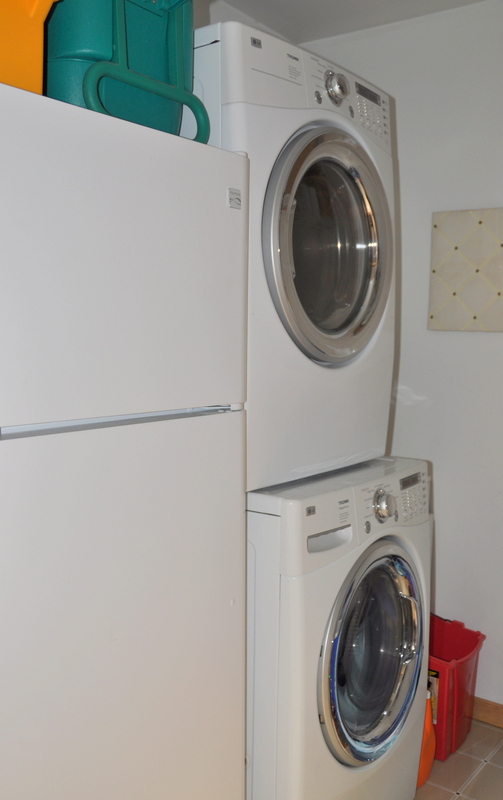 No pets, no smoking, maximum number of occupants is 8, bring own linens and towels (king sheets are provided), bring own drinking water, noise restriction after 11 PM.